International wildfire crews could be called to help fight blazes in the bone-dry West as U.S. officials on Wednesday boosted the nation's wildfire alert to its highest level. "It's driven by a couple of things: The number of large fires we have, and also the fires are occurring in several states and in several geographic areas," Randy Eardley, a spokesman for the National Interagency Fire Center here, told The Associated Press. "The resources we have are being stretched thin." Sixty-eight large wildfires are burning in 12 states across the American west, reports CBS News correspondent Stephan Kaufman. The wildfire preparedness level was raised to five as dry lightning blasted and sparked dozens of new blazes in Idaho, Nevada, Oregon and Utah, where firefighters have been stretched thin. National Guard units also could be mobilized under new level. Since Monday, there have been more than 1,000 new fires reported across the West, Eardley said. He said dry, windy conditions, thunderstorms and temperatures reaching above 100 degrees were forecast to continue across most of the West through next week. A new wildfire that started Wednesday evening at the Idaho National Laboratory swept across about 1½ square miles — or 1,000 acres — of sagebrush and grassland at the federal nuclear research area in southeast Idaho. Its cause was not immediately known, laboratory spokesman John Epperson said. Crews set a backfire to keep the blaze from jumping a nearby highway. The nearest laboratory facility is the Materials and Fuels Complex, about five miles northeast of the edge of the fire and on the other side of the highway. Ethan Huffman, another laboratory spokesman, said the wildfire posed no danger to the complex, which is used for research into nuclear fuel development and is surrounded by sand buffers. But a Gem County resident admitted to CBS affiliate KBCI he was worried. "A little antsy, yeah a little nervous," he said. "It could jump the river and I've heard they do that sometimes and there is a lot of wood and stuff on this side, a lot of trees and things that probably would go if it started, but we're going to pray that it just stays where it's at." 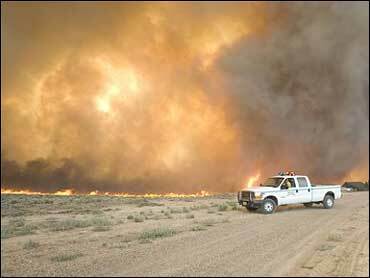 In Nevada, crews Wednesday battled more than two dozen fires burning across nearly 200 square miles of rangeland and timber in the northern part of the state. One threatened hundreds of homes on the edge of Reno. The largest wildfire in Oregon, near Burns in the southeast portion of the state, had grown to more than 200 square miles and was threatening a handful of homes, officials said. And in Utah, two new large fires were reported, in addition to three already burning on about 640 square miles of grass, sage and timber. It was so dry there that some Utah communities banned traditional July 24 fireworks that members of the Church of Jesus Christ of Latter-day Saints normally shoot off to celebrate the 1847 arrival of Mormon pioneers in the Salt Lake valley. In Southern California, authorities warned winds could push the state's biggest blaze, dubbed the Zaca fire, toward about 50 rural homes scattered in Los Padres National Forest in the interior of Santa Barbara County. The fire was about four miles from the Peachtree Canyon community, which remained under an evacuation order, officials said. "This is a dangerous fire that is capable of advancing several miles in a matter of hours," U.S. Forest Service supervisor Ken Heffner said. In Northern California, overnight drizzle helped firefighters battling flames that threatened more than 300 homes in and around Happy Camp in the Klamath National Forest near the Oregon border. "We didn't get enough rain to stop the fire, but we got enough to slow it from spreading," U.S. Forest Service spokeswoman Jodi Marron said. The AT-802A single-engine tanker was fighting a blaze south of Winnemucca when it went down Tuesday evening, said Jamie Thompson, spokesman for the U.S. Bureau of Land Management. The rescued pilot was pulled from the wreckage by firefighters, treated at a hospital and later released, he said.